This Quick Start deploys Spinnaker, which is a continuous deployment tool from Netflix Open Source Software (OSS), on the AWS Cloud. Spinnaker provides cluster management features for cloud resources such as server groups, security groups, and load balancers, and deployment management features, to create and manage continuous delivery workflows. The Quick Start builds a virtual private cloud (VPC) with private and public subnets and secure internet access, deploys a Spinnaker instance into the private subnet, and sets up IAM users and roles. This Quick Start was developed by AWS solutions architects. 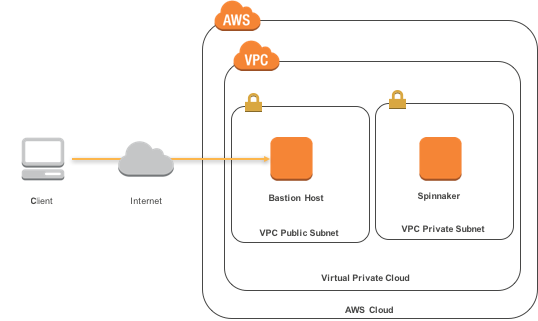 A virtual private cloud (VPC) with two subnets (one public and one private) in the region you choose when you launch the stack. Bastion host in the public subnet for secure remote access. Spinnaker instance in the private subnet. IAM users and roles to manage Spinnaker access. Launch the Quick Start. The deployment takes about 10 minutes. Test your deployment by connecting to the Spinnaker instance and creating a bake and deploy pipeline. This Quick Start doesn’t require a license for Spinnaker, which is open source.